1- Brushless rotary handpiece connects to Port B located in the back of the control box. It runs virtually vibration free with high torque throughout the entire speed range of 1,000-50,000 rpm. Comes with choice of 2.35mm (3/32") or 1/8" collet installed. See additional specs below. 2- Brush type rotary handpiece operates at speeds up to 38,000 RPM and comes with choice of 2.35mm (3/32") or 1/8" collet installed. Connects to Port A in the front of the control. See additional specs below. Sophisticated control box with digital display, variable speed foot pedal, 2 handpiece cradles, and an extra fuse also included. See additional specs below. This brushless micromotor is ideal for various applications at high, medium and low speed. High Speed Applications: Running at high speed, it provides smooth, clean, and sharp detailing in metal and wood. It's also great for bright-cutting, grinding, finishing, texturing, and polishing. You never need to changes the brushes on this handpiece. Medium Speed Applications: At medium speeds it is ideal for effortless and fast stock removal in wood, diestone, or acrylics. Low Speed Applications: The low end offers extra control and power for stone setting and milling. Brush type handpiece connects to port in front. Bur changes are quick and easy with a simple twist of the front section of the Handpiece. Comes with 2.35mm (3/32") or 1/8" collet installed. Handpiece has a slender, contoured grip for precise and very high speed work up to 38,000 rpm. It has a fan cooled, brush-type continuous duty motor that runs cool and vibration free with permanently lubricated, shielded ball bearings that require no lubrication. It comes with a 2.35mm (3/32") or 1/8" collet installed. Bur changes are quick and easy with a simple twist of the front section of the Handpiece. Collet Adapters are available for simplifying changes between accessories with different shank sizes. Comes supplied in Kits K.1070 and K.1090. Also works with the same HP4-917 Control Unit that comes with Micromotor Kits K.1020 and K.1080. 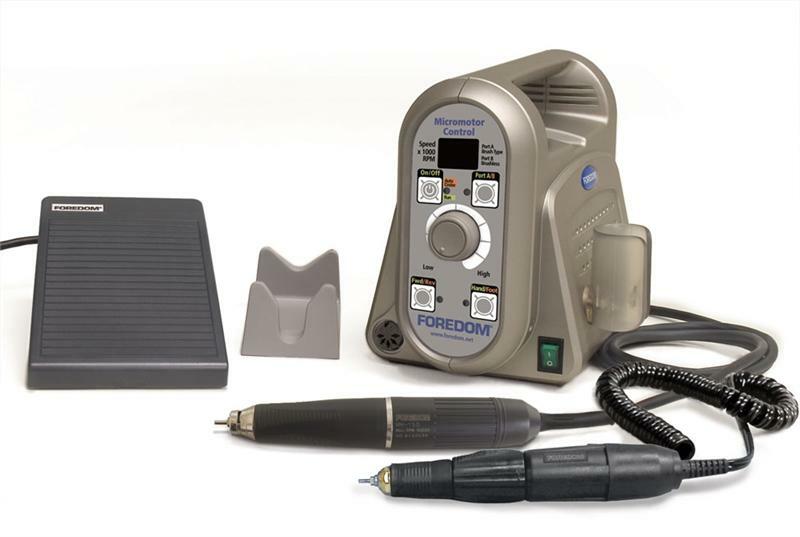 High Speed Rotary Micromotor Kit, 2.35mm (3/32") or 1/8"
Click the button below to add the Dual Handpiece Brushless Kit, 2.35mm (3/32") or 1/8" Collet for Rotary Brushless and Rotary Brush Type, 230V to your wish list.